Industrial Pallet Scales were recently supplied to a steel components manufacturer in Croydon South in Victoria. 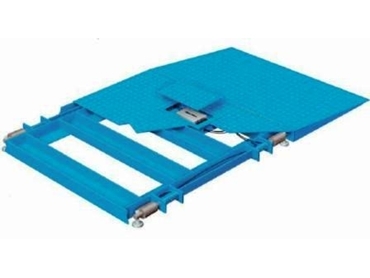 Supplied by Accuweigh’s Salter branch in Melbourne, the Industrial Pallet Scale is being used for check-weighing deliveries of steel received into the store. Accuweigh’s Prodec Industrial Pallet Scale is the ideal scale choice for use in heavy duty weighing applications due to the almost indestructible nature of the weigh bars used instead of normal shear beam load cells. Standard load cells are very susceptible to damage from side forces such as when a forklift drags a heavy object across the weighing plate of the Platform Scales. Not so with Accuweigh’s Prodeck floor scales which uses patented weigh bars that are extremely resilient to all external side forces. These Weigh Bars are usually fully operative even after the scale frame or deck has been nearly totally destroyed by external forces. Another bonus of the Prodeck Industrial Pallet Scales is the very low profile of the Prodeck only requires a shallow pit which saves significantly on installation costs if they need to be installed flush with floor level. Accuweigh is Australia’s largest industrial weighing company and has fully trained and experienced staff that are best able to advice on the ideal product for each and every weighing application – all fully backed by Australia’s most capable service staff.